An Apostille Stamp is a certification established by The Hague Convention (also known as an Apostille Convention or the Apostille Treaty) with the aim of facilitating the worldwide circulation of documents. The aim of the Convention is to abolish the legalization process and replace it with a single formality. The Apostille Stamp authenticates the origin of a public document for use abroad. The word ‘Apostille’ is of French Origin and it comes from the French verb ‘apostiller’ which derives from the old French word ‘pastille’ meaning ‘annonation’ and before it the Latin word ‘postilla’, a variation of the word postea, which means ‘thereafter, afterwards, next’. During the negotiations of the Convention, the term ‘Apostille’ was preferred because of its novelty (Apostille Handbook). The act of procuring an Apostillle stamp on a document under the Hague Apostille Convention is referred to as having been ‘apostillsed’. An Apostille only authenticates the origin of the underlying public document (Art. 5 (2) of the Hague Apostille Convention and does not certify the content of the underlying document (C&R No 85 of the Special Commission). There is no time restriction in regards to the effect of an Apostille. The effect of an Apostille does not expire. 1) Documents emanating from an Authority or an official connected with a court or tribunal, including those emanating from a public prosecutor, a clerk of a court or a process-server. 4) Official certificates which are placed on documents signed by persons in their private capacity, such as official certificates recording the registration of a document or the fact that it was in existence on a certain date and official and notarial authentication of signatures. Greece as a signatory to the Hague Apostille Convention authenticates (apostillises) public documents. Documents issued by the public civil services such as Taxation Authorities, Municipalities, Greek Orthodox Metropolis, Police Authorities, Ministries. Documents issued by the Registry Office. Documents issued by Greek Universities and Colleges. Greek Identity Cards and Passports. Judicial Documents are apostillised by the Court of First Instance of the region where the issuing Authority is seated. Notarial Documents, documents issued by Land Registries as well as Process Server Documents are apostillsed by the competent Prosecutor of the Court of First Instance. Please note that as of April 1st 2014 birth, marriage and death certificates issued from the following countries: Austria, Belgium, France, Germany, Switzerland, Spain, Italy, Luxembourg, Netherlands, Portugal and Turkey do not need to bear an Apostille Stamp for use in Greece (Law 4231/2014). Our office can assist you with procuring all sorts of documents from Greek authorities and prepare them for use abroad by procuring an Apostille and produce certified translations. Contact us for information at info@jg-greeklaw.com. New tax law 4174/2013 brings changes in the way tax statements are submitted in Greece. Namely, as of 1/1/2014, the tax is calculated at the time of submission and finalization of the tax statement. That practically means that when the tax statement is finalized and a tax is assessed, at the same time a payment slip is issued, which must be paid only at the bank or Post Office (not the Tax Authority). Note that if the taxpayer realizes he made a mistake after submitting his tax statement, he must pay the tax due, resubmit the tax statement and then get a refund if necessary. Tax statements are submitted only online and the online system will begin to accept submissions (as is currently announced) on March 20, 2014. The deadline for tax statement submission this year is June 30, 2014. No extension has been announced at this point but may be granted. We look forward to receiving your feedback, comments and inquiries. In March of 2010, the Ministers of Finance and Environment, Energy and Climate Change signed a joined Decision, approving the Regulation of Energy Efficiency of Buildings. This Regulation now fully implements the Law 3661/2008 as amended by Article 10 of Law 3851/2010, regarding the Energy Efficiency of all Buildings. 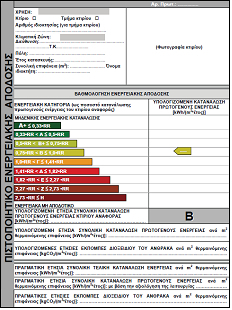 Based on the above legislation, starting January of 2011, before an owner of a property in Greece larger than 50 square meters can rent it, sell it or renovate it, a Certificate of Energy Efficiency will be required. For storage rooms and parking spaces such a certificate is not required. The areas of the building that have been legalized or regulated pursuant to legal provisions are included in the total square footage of the building. This Certificate will be issued by the Energy Inspectors (private Engineers who have completed a series of special Seminars and are certified by the State as qualified to issue these types of Certificates, who will be included in a special Registry). These Inspectors will inspect the property and issue the so called “green Identity”, which will state the amount of energy the structure consumes and the actions/repairs required for the improvement of the energy efficiency. The required certificate will rate the property pursuant to an energy scale, similar to that of electrical appliances and will be valid for 10 years. Our office can assist all our clients who own properties over 50 square meters in Greece, through our network of qualified and certified Engineers and Inspectors. Greece becomes the 16th EU member state adopting Regulation 1259/2010 (Rome III) in regards to divorce proceedings. Rome III allows international couples to choice the law to be applied to their divorce or legal separation proceedings. The so-called principle of freedom of will is thus the guiding principle in EU divorce proceedings under Rome III. Yet, the choice of applicable law has limitations in the sense that it can be only within certain countries’ legal systems which are somehow connected to the relationship. In addition, the Regulation provides for the law to be applied in the event of no selection on the part of the parties to be divorced. In the event the couple cannot agree on the applicable law, a common method will be available to Judges to assist them in deciding which country’s law to be applied. As far as the connection elements go, Regulation 1259/2010 puts more weight in the habitual residence of the parties as opposed to nationality, both in regards to the law available to the parties to choose from and the applicable law in the absence of a selection from the parties. Rome III aims to limit forum shopping but has no effect in national divorce and marriage legislation of the EU member states. The validity of a marriage is still determined under each member state’s law. If -for example- a marriage is not valid under Greek law, Rome III is inapplicable in Greece in that case and Greek law is not available to be selected as a forum for the specific divorce. On March 12, 2012, a new Law came into effect, changing the everyday legal practice on a number of practice areas for thousands of legal practitioners in Greece. Law 4055/2012 was another step towards reorganizing the Greek Public Sector and attempting to breathe new life into specific legal provisions that remained in reality unenforceable due to the series of “loopholes” or beaurocratic requirements that rendered these provisions meaningless. Although the Greek legislature aspired to make the Greek judicial system far more flexible and efficient through these changes, it once again failed to “go all the way” in resolving conflicts between the newly established legal provisions and prior sections of the laws that remain in effect and continue to regulate the same issues, thus causing new complications that the future legislature will once again need to address. In this article, we will provide a brief enumeration of those changes that we feel are of more interest to the Greek omogeneia as well as those foreign citizens that own property in Greece or have a family with a Greek citizen. The first major change introduced is the attempt to simplify the consensual divorce procedure. Up until now, the parties ought to have been married for at least a year, needed to file a petition for a consensual divorce (both represented by counsel) and two separate hearings were required (with the second hearing being scheduled at least six months after the first one). In addition, when the spouses had minor children, an additional requirement was the execution of a Custody and Visitation Agreement between the parents, which must be filed along with the divorce petition. Under the new Law, which amended the relevant Sections of the Greek Civil Code, a consensual divorce is available to spouses married for at least six months and only one hearing is now required. More specifically, the spouses wishing to dissolve their marriage, must execute a written agreement where they state they dissolve their marriage. This agreement must also be signed by their attorneys or their attorneys only (provided they have valid Power of Attorney documents from their clients dated no more than a month from the time of filing of the divorce petition). The attorneys with or without the spouses file this agreement with the Court and at the same time the hearing is held. The judgment issued constitutes the divorce. One more addition of the new law is that the spouses can also now regulate child support and their agreement as to this matter is incorporated into the divorce judgment, which is now enforceable without any further requirement. Finally, the new law states that it also regulates already pending divorce hearings, where the first hearing has already taken place. It remains to be seen, however, how exactly this will affect the currently pending consensual divorce petitions. On the other hand, Articles 14 and 15 of the new Law attempt to address and resolve a pre-existing flaw in the legal provisions regulating leases and terminations of lease agreements. Up until Law 4055/2012 was voted and came into effect, landlords, when facing a non-compliant tenant (i.e, when their tenant failed to make prompt rent payments) were given the following three options: 1. File an eviction lawsuit against their tenant, seeking to recover all rents owed and regain possession of their property. The flaws of this option were the timeframe required for the plaintiff to obtain a final judgment that would allow them to collect the monetary award and take their property back (in some instances it can take up to two years for a final resolution) and the fact that all the tenant had to do is show up in Court on the hearing date and pay the rents owed; the Court would then automatically dismiss the case and, although the landlord now has his rents, he has likely paid twice as much in legal fees and court costs, thus having suffered financial damage and hoping his or her tenant will be more prompt in the future. 2. The second option was to take advantage of the “speedy eviction” provisions that allowed him or her to serve a Notice of Termination of the Lease Agreement for non-payment of rents and 30 days later file an Eviction Petition with the competent Court seeking possession of his property. Although this path could lead to the landlord regaining his property in as quickly as a month or two from the hearing, it again had one significant flaw: the landlord had to forget about the rents owed. This “speedy” eviction was for possession of the property only, rents had to be claimed under the first option above (the lawsuit). It seems property owners once again had to cut their losses short: either go after their money or their property. As for the third option? Well, 3. Do nothing and hope the tenant will either decide to leave on his own or suddenly decide it is time he started complying with his obligations and catch up with his rent payments (if one can really call this an “option”). The new Law resolves the above dilemmas in what appears to be an effective way, in theory at least. For the first time, a landlord can go after both possession of the property and all amounts owed by the tenant (not only rents, but also unpaid utility bills and maintenance fees) with the same petition. In addition, the notice of termination can now be served only 15 days before the filing of the petition (instead of 30 days that the prior provision required). The landlord, after 20 days of service of the eviction Order upon the tenant, can proceed with executing the Order and regaining possession of the property. This is a positive development that aspires to resolve a lot of the issues property-owners face, especially these days when the real estate market suffers and the instances of non-paying tenants have increased dramatically. It remains to be seen, whether these new provisions will prove as effective in practice as they aim to be in theory. The new Law introduces a series of other changes, not only in civil procedure but also in criminal and administrative law. Jurisdiction of the Courts is transferred in several instances from higher to lower Courts (a change that has been unsuccessfully attempted in the past as well), dispute resolution is introduced for the first time as an alternative to litigation and provisions are passed regarding timeframes within which judgments must be issued. It is an ambitious project, we must admit, but we remain skeptical as to its implementation in the everyday legal practice. Greece has started a new immigration program in hopes that it will boost its suffering due to the economic crisis real estate market by encouraging investments. According to the new Law 4146/2013, third-country citizens (non-EU citizens), who buy property in Greece, the value of which reaches or exceeds the amount of €250.000, may obtain 5 year residence permits. Furthermore, third country citizens, who have signed rental agreements for hotels or touristic facilities for the amount of €250.000 or more, may also acquire 5 year residence permits. Only the immediate family members of the person making the investment have the right to obtain said permits. A husband and wife can purchase one said property in joint tenancy, of €250.000 value. For more than one co-owner who are not married, each person’s interest in the property should be at least €250.000. It should be clarified that if a person of a third country decides to invest in Greek property pursuant to this Law, they can only obtain a Greek residence permit (renewable every five years for as long as they continue to own the property), but not a Greek passport/citizenship. The process involves first applying for an entry permit to the Consulate of the applicant’s place of residence. 1) Αcertificate of an A class bank or of any other financial institution, which certify the existence of at least 250.000 Euro and also the intention of the applicant to purchase the property. 2) Two application forms. The aforementioned application must be submitted by the applicant himself of by an attorney at law, but at the time of the submission the applicant must be present in Greece. 3) Three resent color photos. 4) A certified copy of the applicant’s passport. 5) A health certificate issued by a Greek hospital verifying that the applicant has no health issues that would pose a danger to public health. 6) A certified copy of the purchase Deed. 7) A Notary’s Confirmation that the purchase Deed fulfills the provisions of law for obtaining a residence permit. 8) A Land Registry certificate. 9) An Insurance Policy proving that the applicant can cover his medical expenses while in Greece. 10) A 75 € application fee.